The graph to the right shows the results of a 2008 poll of 500 police chiefs in the United States, conducted by R.T. Strategies of Washington, DC. 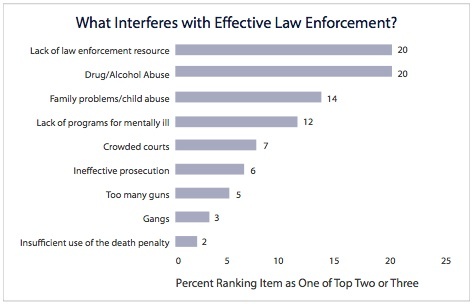 Police chiefs ranked the death penalty last when asked to name one area as "most important for reducing violent crime." Higher priorities included increasing the number of police officers, reducing drug abuse, and creating a better economy. Smart on Crime: Reconsidering the Death Penalty in a Time of Economic Crisis. In this 2009 study, the nation’s police chiefs rank the death penalty last in their priorities for effective crime reduction. The officers do not believe the death penalty acts as a deterrent to murder, and they rate it as one of most inefficient uses of taxpayer dollars in fighting crime. Criminologists concur that the death penalty does not effectively reduce the number of murders. 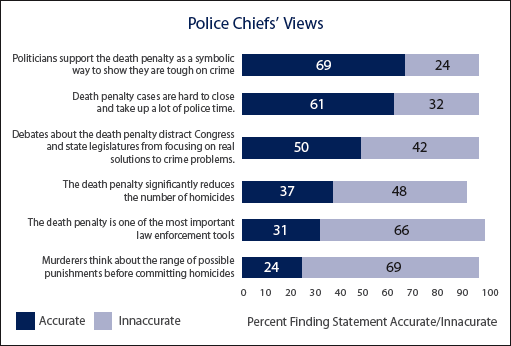 On the Front Line: Law Enforcement Views on the Death Penalty A 1995 national survey of police chiefs from around the country discredits the repeated assertion that the death penalty is an important law enforcement tool. Research reported in Homicide Studies, Vol. 1, No.2, May 1997, indicates that executions may actually increase the number of murders, rather than deter murders. Prof. Ernie Thomson at Arizona State University reported a brutalizing effect from an execution in Arizona, consistent with the results of a similar study in Oklahoma. The overall firearm-related death rate among U.S. children less than 15 years of age was 12 times higher than among children in the other 25 countries combined. The firearm-related homicide rate in the U.S. was nearly 16 times higher than in all of the other countries combined. The firearm-related suicide rate was nearly 11 times higher.